The Pat Feinucane Centre said it had found documents which show that the location of the torture centre was at Ballykelly in County Derry, now a British Army base. One of the so-called 14 ‘hooded men’ held there says further investigation is needed into why the British government failed to reveal its true location when it gave evidence to the European Court of Human Rights (ECHR) in the 1970s. The 26-County government is also being asked to investigate why the existence of the base was kept hidden for so long. In January 1978 the European Court of Human Rights found that the British government was guilty of subjecting 14 men to the inhumane and degrading treatment after they had been subjected to controversial deep interrogation techniques. This included having had hoods placed over their heads and forced to stand spread-eagled against a wall for seven days with little or no food, water or sleep. It has now emerged that preparations for the use of deep interrogation began six months before interment, when in April 1971, the British Army’s Joint Services Interrogation Wing (JSIW) began training RUC Special Branch officers in Belfast. Forty years on the 14 detainees have still not been officially informed where they were interrogated. Following the allegations of torture the Dublin government took a case to the European Commission on Human Rights, which found the London government guilty of torture. The use of torture is acknowledged as a low point in Britain’s occupation in the north of Ireland, and its exposure marked a turning point. In a confidential memo, dated October 1971, the British army’s Director General of Intelligence, Harold J. Maguire, states that the five techniques of sensory deprivation interrogation used against the Ballykelly detainees had previously been used against prisoners in British camps in Malaysia, Kenya, Cyprus, Brunei and Korea. 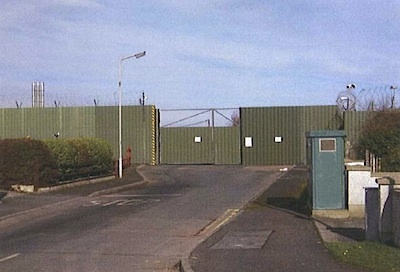 Despite Ballykelly being the only location where the detainees were subjected to deep interrogation methods, its use was never disclosed to the ECHR. It was long believed that the men were held at Palace Barracks near Holywood and Ballykinler in County Down. Another memo marked ‘For UK Eyes Only’, outlines the public defence which the government should take to defend its use of hooding, white noise, sleep, food and sensory deprivation on the detainees. One senior army officer absurdly claimed that most of the detainees had wanted to keep hoods _on_ their heads for seven days “quite voluntarily” and described the sensory deprivation suffered by the detainees as an advantageous “spin-off”. The British memos confirm six of the detainees were forced to spend in excess of 30 hours “on the wall” - standing hooded, in a stress position against a wall. One detainee spent 49.5 hours “on wall”. The uncovered evidence contradicts information provided to the European Commission for Human Rights. Such information was also not disclosed to either the Compton or Parker inquiries of the Westminster parliament.